Today we look at Cushing’s first performance as Sherlock Holmes, in the Hammer Film THE HOUND OF THE BASKERVILLES (1959), screenplay by Peter Bryan, based on the novel by Sir Arthur Conan Doyle. Since this is a Hammer Film, this version of the famous Sherlock Holmes story emphasizes the supernatural and suspense elements. 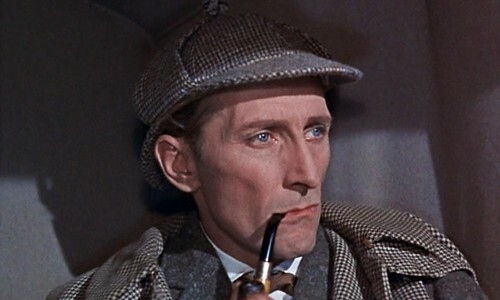 It’s actually a great little movie, and I’ve always felt sad that Hammer didn’t make a series of Sherlock Holmes movies starring Peter Cushing. This was the only one they did. Evidently, it didn’t do all that well at the box office. Anyway, Peter Cushing makes for a phenomenal Sherlock Holmes, and he gets to deliver a host of memorable lines along the way. We’ll start off with a Peter Cushing signature line, the type of line he might say in any number of his movies. Van Helsing, for instance, easily could have uttered this line. Watson (Andre Morell) has just discovered that Holmes (Peter Cushing) has secretly been investigating the moors outside Baskerville Hall gathering information. Holmes turns to Watson and utters a grave warning to his friend. I’ll say! The Hound from Hell is patrolling these moors! Later in the movie, Holmes believes Sir Henry Baskerville’s (Christopher Lee) life to be in danger if he visits the Stapleton family. Now, the Stapletons have invited Sir Henry, Holmes, and Watson to dinner, and since Sir Henry has feelings for Stapleton’s daughter, he’s eager to go. Holmes needs to avoid joining them so he can be free to protect Sir Henry from a distance. To do this, he’s purposely rude to Sir Henry, mocking him for socializing with poor peasants. SIR HENRY: I wouldn’t dream of going without you. HOLMES: My dear Sir Henry, if you really wanted us to come with you, you’d have told us about the invitation much sooner than this. You’d better be off. You mustn’t be late for your peasant friends. SIR HENRY: I don’t like that Holmes. HOLMES: I don’t like the people you’re mixing with. I should have thought in your new position you would have cultivated worthier friends. I hope you enjoy their rabbit pie. Cushing has such a way with lines like this. When Christopher Lee’s Sir Henry storms off in an angry huff, you know exactly how he feels. When Holmes is confronting the irritating pompous Dr. Mortimer (Francis De Wolff) he has had all he can take from the annoying man. He sets up the doctor for a dramatic revelation. Upon which Holmes hurls a dagger onto the table, its sharp point stabbing the wood. Early in the movie, as Holmes and Watson agree to honor Dr. Mortimer’s request to travel to Baskerville Hall to protect Sir Henry Baskerville, the wheels of how he will handle this case are already turning inside Holmes’ head. He sets up the situation so that Watson will go on ahead, leaving him free to conduct undercover work. When Sir Henry suggests they leave today, Holmes feigns disappointment, but then comes up with a brilliant suggestion. SIR HENRY: If you attach so much importance to this, why don’t you come down to Dartmoor with me today? You can pack before the train leaves. HOLMES (shocked): “You’re going today? I can’t possibly leave town until the end of the week at least. (But then, the brilliant suggestion.) Watson? You’re free at the moment, aren’t you? And we wrap things up with a look at Holmes’ dire warning to Sir Henry, about keeping off the moors. HOLMES: I must insist upon one thing. Under no circumstances are you to go out onto the moors at night. Wise advice, echoed years later in AN AMERICAN WEREWOLF IN LONDON (1981): Stay off the moors! Hammer Films’ THE HOUND OF THE BASKERVILLES (1959) is highly recommended. It features one of Peter Cushing’s best performances, as Sherlock Holmes. That’s it for now. See you again next time.